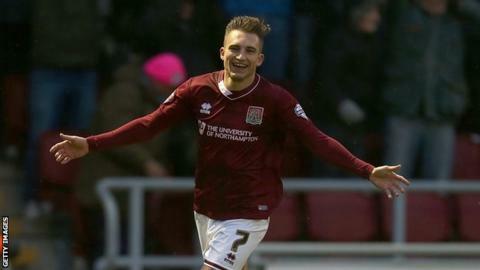 Northampton midfielder Lawson D'Ath has signed a new two-and-a-half-year contract with the League Two leaders. The 23-year-old former Reading trainee has scored 13 goals in 73 matches since joining in the summer of 2014. "It's good to be a part of this club and what's going on at the minute, hopefully we can just keep it going now," he told BBC Radio Northampton. "It's crazy when you look back - a week before the season started I go on trial and the rest is history."